3D printing food is one of the implementation of the additive manufacturing technology that we constantly see on the Internet. This reflects the dream of taking the 3D printing technology to the food industry and use it to open more opportunities in this niche. Most of the 3D printing food projects depend on one single idea, which is replacing the 3D printing materials with food, which is presented in a semi-liquid form. The 3D printer head is replaced with a tube, cartridge, syringes or container that ensure injecting the food on a regular based during the printing similar to the 3D printed clay project we explored earlier. Previously, we explored the 3D printing with sugar and how to create unique shapes that were not available using the normal manufacturing methods. Today’s project is another experience that use the 3D printing food technique to create delicious dishes of colors humus. The project is created by 3D printing enthusiast from Spain, Luis Rodriguez. In th last few years, Luis has researched how to use the 3D printing technology to create unique food. In his website, you can explore more about him and the experiments he created before the 3D printed humus project. Luis used a Pinya 2 Delta-style 3D printer, which he built himself. As he mentioned any 3D printer with syringes, cartridges or capsules can be used in the project. Delta-style 3D printers can achieve this goal as it can accept this type of heads instead of the normal filament extrusion heads. Then, the 3D printer is supplied with colorful hummus as steady flow while printing the dish. the hummus is colored using food colors or icing colors. The thickness of the hummus should be semi-liquid and in order to achieve this, a recipe of hummus, tahini, olive-oil, salt, avocado purée and tomato is used to create the material. Once the recipe is ready, he decided the colors that will be applied with for the whole composition or different colors for each part to create gradient output. Also, he can also add different color for each 3D printing container. Once the material is ready, Luis added it to the 3D printer syringes. 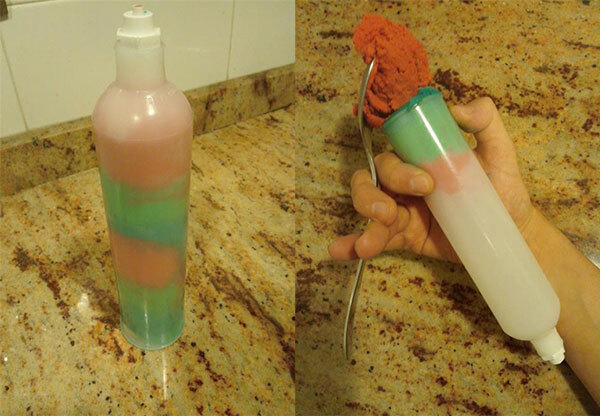 Using different colors and combinations is experimental and can output interesting results by mixing colors in the 3D printer syringes or containers. filling the syringes require removing all the air pockets to avoid gaps while printing. Then the 3D model is printed using the hummus recipe based on the STL file chosen to create different shapes with various of colors. While many 3D models can be used in the 3D printing, the material used should put into consideration to avoid any failure. The 3D printing food experiments indicate many unexplored fields for the 3D printing technology. These experiments need to join forces and share knowledge experience in order to reach a professional output that can be used on industrial level.